There needs to be some additional investigation into the deaths of at least two of the 17 inmates that died in the Camp Street Prison Riot on March 3, says Fire Chief Marlon Gentle. 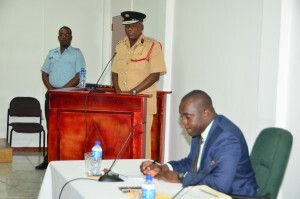 The Fire Chief made the statement while testifying for a second day at the Commission of Inquiry into the fire at the prison. Gentle told the Commissioners stated that the scene was horrid and recalled that one of the bodies was headless. He is the second person to mention a headless torso at the CoI. “One body with the head removed from the torso at variant or good distance away…One body hunched on a toilet set with the insides out…the last two needs some more investigation,” said the Fire Chief. He said that as a former Fire Investigator he found the scene to be out of the ordinary, since the bodies also had some other injuries. “Fifteen of my years was spent in the investigative arm of the fire service…I have seen a lot…The degree of destruction and the level of injuries the bodies would have suffered…the degree of damages that body would have sustained…even with the violence of that explosion the body – is not supposed to,” said Gentle. He said both of the bodies would have suffered trauma that was unrelated to the fire. “There were subject to some level of force being applied to them by striking or stabbing or whatever,” he stated. Being a fireman for over three decades, the Chief Fireman opined that he does not believe any fireman could stand and say to that he is okay with what was seen on the day of the riot. Asked to comment on what could have caused the fire to spiral out of control, the Fire Chief pointed out that while the building was concrete, there was an abundance of combustible materials inside. He pointed out that these materials, when burned, would release a flammable vapor which would then cause a “flash” that would instantly spike the room’s temperature.